To this end, I urge you to take the opportunity if ever you're in the country to experience a traditional Malaysian teatime and sample some of our unique teatime fare. Truth is, Malaysians love teatime. Typically enjoyed during mid-afternoon, it offers a brief breakaway from the daily grind to catch up with friends and workmates or simply to chill. More significantly, it's when we get to satisfy our post-lunch food cravings before the evening's main meal (yes, we Malaysians seemingly can't stop eating). Here, for the benefit of my foreign readers, are some of our favourite teatime eats. 1. KAYA ON TOAST. 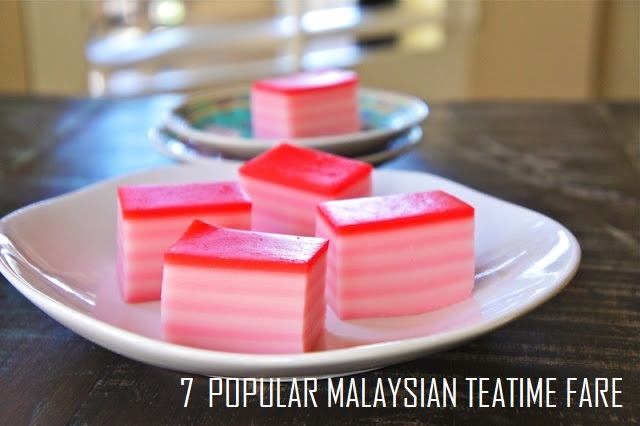 This is an extremely popular teatime snack among Malaysians. Kaya is essentially a sweet, creamy coconut spread made from coconut milk, eggs, sugar and flavoured using pandan (screwpine) leaves. Popular in Malaysia and Singapore, a well-made kaya spread sandwiched between warm toast - more so with a few thin slices of cold butter thrown in - truly is a recipe to die for, and tales of visitors getting hooked on this unique Malaysian offering are not unheard of. Best enjoyed with "Kopi-O" or black local coffee. 2. CURRY PUFF. This is a deep-fried puff pastry (not unlike the Spanish's empanadas) with special curry-based fillings. The curry is usually thick and dry to prevent it from oozing out of the pastry shell. 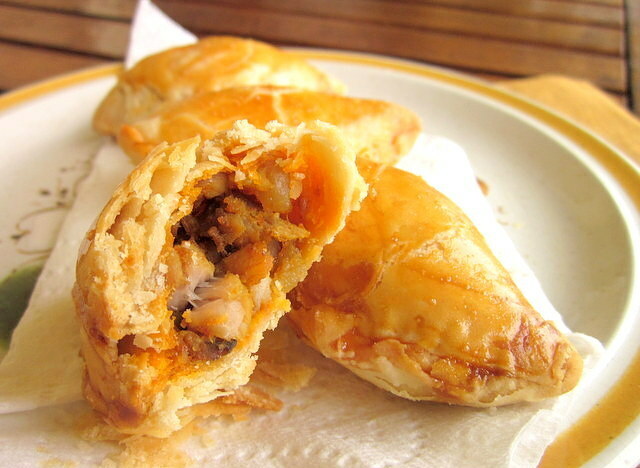 Especially popular as a light snack in Malay and Indian eateries, curry puff fillings come in many variations. These include vegetarian, egg, potato, chicken, sardine and even Paneer. Sometimes spicy but rarely hot, curry puffs make for an excellent afternoon snack. 3. 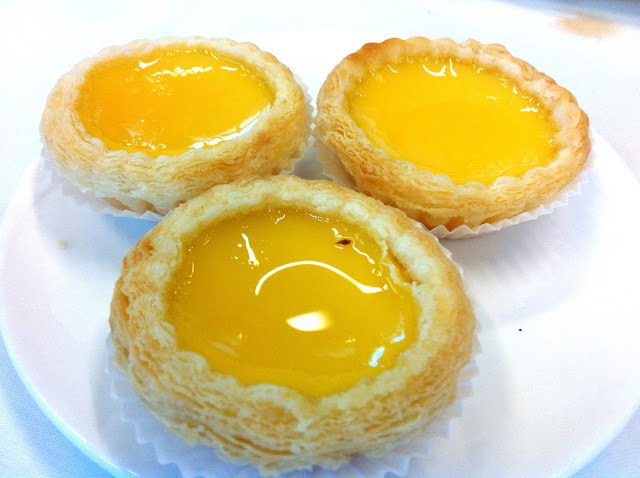 EGG TART is essentially a custard tart consisting of a pastry crust filled with egg custard. The pastry of a perfectly-baked egg tart is flaky and aromatic, and the custard sweet and velvety soft. Immensely-popular in this part of the world (more so in the Far East), egg tarts are best enjoyed with a cup of hot milk tea or white coffee. Probably the lightest snack among the six mentioned here. 4. KUIH LAPIS [translation: cake (kuih) and layered (lapis), i.e. layered cake]. Despite its name, kuih lapis isn't exactly a "cake" per se. 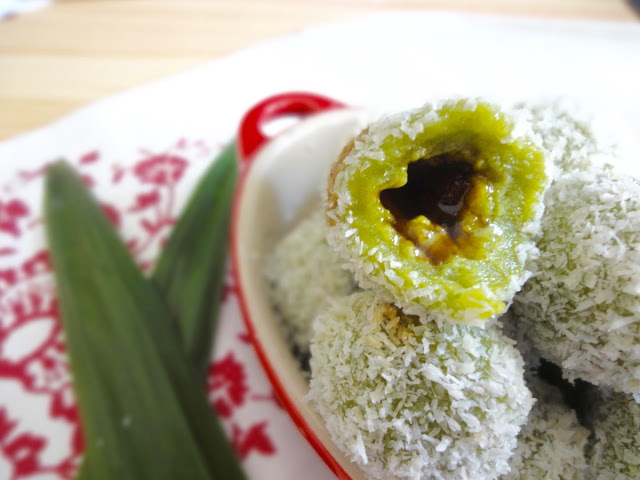 This is because the term kuih (pronounced "koo-ay") is broadly used in Malaysia as a reference to any bite-sized cakes, cookies, dumplings or pastries. 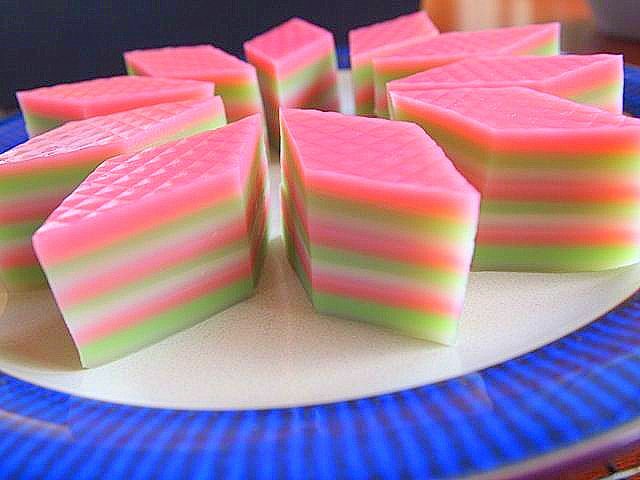 Kuih lapis is a rich, sweet steamed "cake" consisting of thin alternating layers made from rice flour, coconut milk, eggs, butter and sugar - each coloured with edible colouring and laboriously piled one on top of another. The rich and unmistakable taste of coconut makes kuih lapis a truly delicious Malaysian offering that will leave you wanting more. And more. 5. ONDE-ONDE (pronounced on-day-on-day) This is a traditional Malaysian kuih made from glutinous rice flour shaped into bite-sized balls infused with pandan (screwpine) leaf juice and thick, concentrated palm sugar. These are then steamed and, before serving, rolled in with generous amounts of soft, steamed grated coconut. What makes onde-onde truly special (and some say addictive) is how the palm sugar within literally bursts into your mouth each time you take a bite, waking your taste bud like few other foods can. Definitely something every visitor to Malaysia must try before they leave. 6. PEANUT PANCAKE. 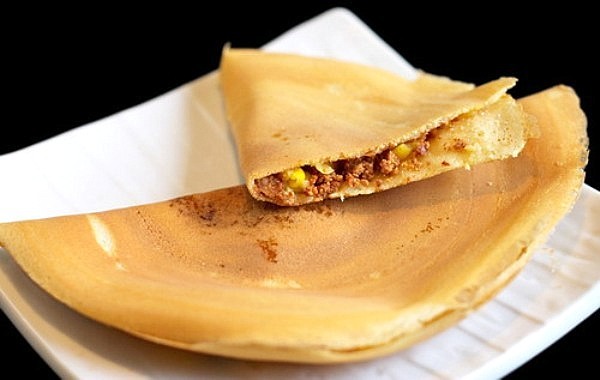 In it's most basic form, peanut pancake is a crisp, thin pancake generously filled with butter, roasted ground peanuts and creamy sweet corn. The pancake is then folded into a semicircle and cut into wedges before serving. Despite its popularity as a teatime snack, peanut pancake is also sometimes enjoyed as a dessert - especially in the evening. My personal favourite among the seven goodies mentioned here. 7. PISANG GORENG. Literally translating into "fried banana", pisang goreng is arguably the No. 1 teatime snack food in Malaysia - possibly even in South East Asia. Making them is easy; the banana is simply battered and deep-fried. That's it. Best enjoyed with piping hot black local coffee. Heavenly stuff. All of the teatime snacks I've mentioned here can easily be found at any of our many open-air night markets, street vendors or traditional, ceiling fan-type of coffee shops around the country. They're inexpensive as well; prices range from only USD0.30 for four pieces of kuih lapis or pisang goreng to USD0.40 for one curry puff or peanut pancake. Malaysians love them, I love them and I've no doubt you will too. But, hey, don't take my word for it; come to Malaysia and find out for yourself how good they really are. Bon appetit! Which of the teatime fare here do you think you'll like most? Or if you've been to Malaysia, have you tried any of them? Which was your favourite? 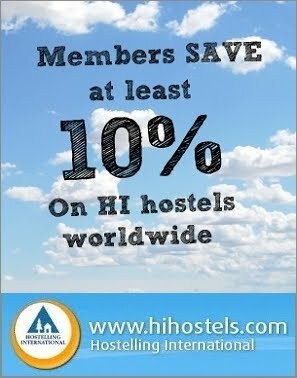 A friend of mine recently went to Vietnam and he told me about this service there www.greenvisa.io/. 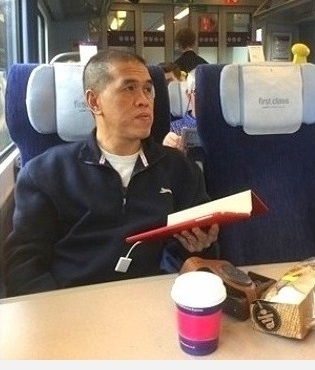 According to his words, this is like the ultimate tour operators one would want to hire while in Vietnam. 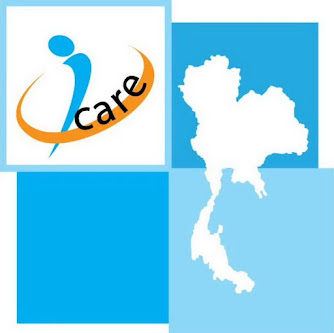 I am really looking forward to using their services.